Are you tired of seeing your friend cry or breakdown in an abusive relationship with his/her partner? Come what may, there are those individuals who do not mind holding on to a toxic relationship. Here, in this article, we are revealing to you about the zodiac signs that are known to be the worst in terms of being patient enough and letting a toxic relationship grow over them! These individuals do not mind getting abused in a toxic relationship, as they expect it to be the best deal for them. These zodiac sign individuals love being in a toxic relationship and have no plans of breaking up any sooner! 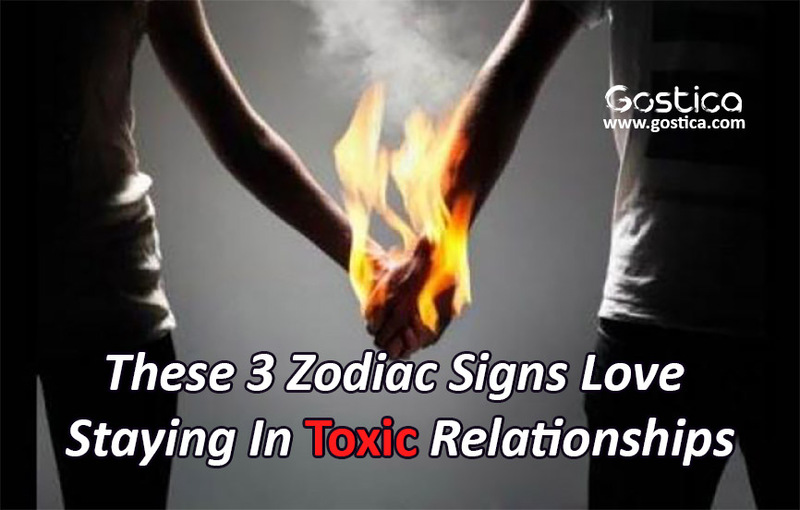 Check out the list of zodiac signs and the individuals who love to stay in a toxic relationship. Taurus individuals are known to be the most loyal sign of the zodiacs. They make great, loving and supportive partners. These individuals have a tendency to take their loyalty a bit too far. They are attracted to stability, and hence try to make things work with a partner with whom they would have a toxic relationship with. They like to sustain and secure things and make them grow for a sense of stability as well. In order to get over a toxic relationship, they need to realize their strongest loyalty needs to be with their own self. Once they get this clear in their mind, there is no stopping for them. Libra individuals love partnerships. Being in a partnership is said to balance them well. These individuals would rather put up with some negativity and stay right where they are than leaving situations mid-way and feeling unbalanced. The interesting fact about this sign is that these individuals are highly independent in terms of other relationships. But once when they get into a relationship, they can hardly tie their shoes by themselves as well! They value the connection and the support of a partner. They tend to allow themselves to ignore the negatives in a relationship and pick up on the little positives that they have in the relationship. To move on, they need to realize that they are really good at relationships. Hence, they should not hold themselves back from finding someone healthier for the relationship. Pisces individuals are known to have quite a few personality traits which make it easy for them to stick around in unhealthy situations. These individuals are known to be the sign of sacrifice, and their acts of martyrdom can make anybody cry. They have great ability to step out of reality and ignore the things happening around them, but eventually, they choose to ignore and yet stick on, as they believe that things will change for the better. Recommended: 14 Most Toxic Spiritual Habits That You Should Stop Doing RIGHT NOW! These individuals should realize that the needless self-sacrifice is not going to fetch them a great deal, as they are the ones who would suffer the most. Being in a toxic relationship can be the worst decision that one can think of. If you know an individual who needs to break through it, do help them out, as most of the times, the victim do not realize that they are bound by the toxic relationships. What is your take on this? Let us know in the comment section below. For more interesting zodiac facts, check in our section, as we reveal to you more interesting and unknown topics about each zodiac sign.